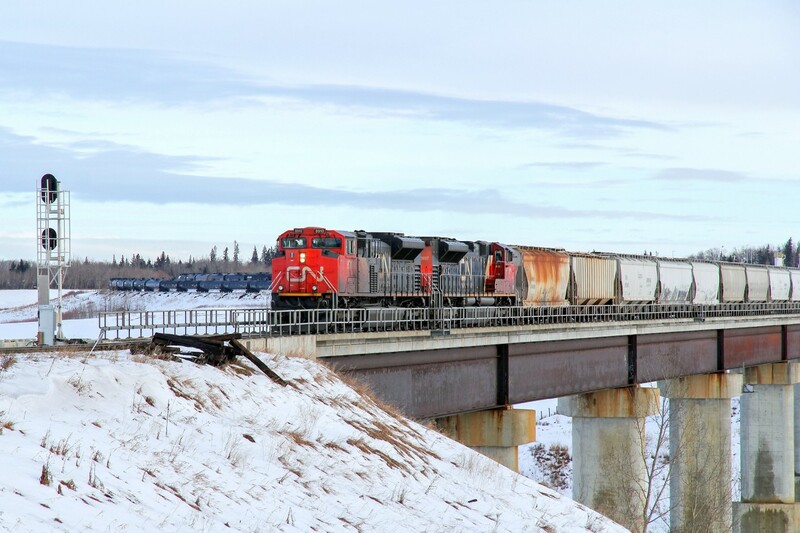 Railpictures.ca - colin arnot Photo: A pair of SD70M-2s, CN 8910 and 8937 cross the North Saskatchewan River at Scotford looking every bit like a main line road train but actually taking the Beamer industrial spur to Redwater. | Railpictures.ca – Canadian Railway Photography – photographie ferroviaire Canadienne. Caption: A pair of SD70M-2s, CN 8910 and 8937 cross the North Saskatchewan River at Scotford looking every bit like a main line road train but actually taking the Beamer industrial spur to Redwater.